If you were asked to ever name the most famous black person in a science fiction film you could be forgiven for saying Yaphet Kotto from Alien. You could even be forgiven for suggesting Samuel L Jackson as Nick Fury or even as Mace Windu. 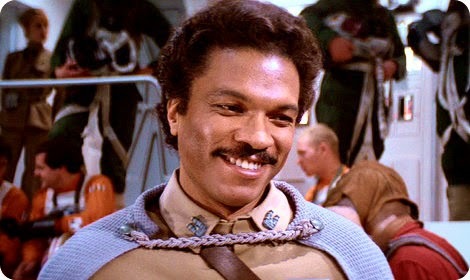 But if someone prompted you with Billy Dee Williams as Lando Calrissian, and you were like 'huh?' then you'd never be forgiven because Lando is where it's as far as Star Wars characters go and one of the most iconic sci-fi characters played by a black man. Yes, you have the space smuggler of Han, the wide-eyed boy of Luke and the Wookie charm of Chewbacca but when Empire threw Lando Calrissian into the mix, we got it all - the confident ladies man with a backstory we just knew we wanted to know more about. He was the guy who seemingly betrayed his gambling buddy but all along was desperate to help Han and his old buddies. And as for Jedi when he lead the assault on the Death Star II? Legend. So what is the back story of Lando? What is the trivia you need to know and what are his best lines? We'll we'll do our best to share! One of the first ideas for Lando Calrissian was to have him as a clone who survived the Clone Wars who leads legions of clones. Ultimately he was made his own man and Jango Fett kind of took that role. Originally scripted as having the name of "Lando Kadar". Yaphet Kotto, who we mentioned above, was apparently offered the role of Lando Calrissian but turned it down. Clearly, Kotto was an idiot. While the Expanded Universe took Lando in some interesting directions, Empire suggested that Lando and Han had a long back story, indeed Han Solo won the Millennium Falcom from Lando in a game of Sabbac. In the first instance, the 'bat ship' fell into the hands of Lando Calrissian after a card game of sabacc from a gambler called Cix Trouvee. Lando, ever the ladies man had some pretty sweet lines in Empire and Jedi. With Billy Dee Williams returning to the franchise, we can't wait to see what he has to say! Luke Skywalker is arguably irrelevant to the last half of the Return of the Jedi. If you think about it, in terms of destroying the Empire, Luke didn’t need to be on the Death Star as Lando Calrissian had that covered – the Emperor and Vader operating as two Sith Lords working in tandem to rule the Galaxy would have been destroyed when Lando blew up the Death Star. Right?